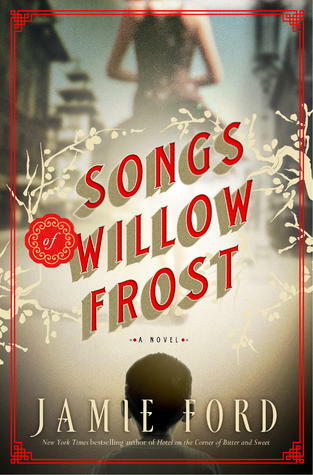 Thanks to TLC Book Tours, we're pleased to present a review for Songs of Willow Frost, a new historical fiction novel by Jamie Ford. Make sure to check out the rest of the tour stops to see other reviews! In Songs of Willow Frost, we follow William, a young orphaned boy in the 30s who knows full well that he's unadoptable because he's Asian. His life at the orphanage is lonely, and his only two friends are Charlotte, a blind girl with a dark family history, and a Native American boy. William and Charlotte embark on a quest to escape the orphanage so that William can find Willow Frost, a new star who William swears is his mother. In between following William on his quest, we have chapters telling of Willow's background, and how she moved up from being a poor girl singing for tourists at a sheet music shop to being a sought after actress and singer. William's story is sad, seeing the discrimination he faces and the harsh treatment he endures at the orphanage, but Willow's is downright tragic. I don't want to spoil the story with details, but let's just say that I felt so sad for her when I was reading her story, as she really did have everything going against her. One of the things I enjoyed most about this book was that it was about a period of time (the '20s and '30s) and a group of people (Chinese-American immigrants) that I don't frequently find myself reading about. I felt like I got a lot of insight into how tough their lives were, and how some people still managed to find the good in terrible situations. It's a glimpse into a very ugly part of American history, and it was interesting to see much of it through the eyes of a child who doesn't always understand why things happen the way they do. I do feel like this could have been a little more tightly edited in some place. Much of the writing was beautiful while being very sparse, but there were some times where the dialogue seemed more stilted than others, which was somewhat jarring. Overall, though, it is a sad story but not without its silver lining by the end -- you just have to endure a lot of heartbreak for William, Willow, and everyone else before you get there.. While there's nothing too graphic in the book, themes do include racism, ableism, sexual assault, physical abuse/punishment, and suicide, so it may be better for more mature readers. I really like the cover for this one. It offers a great picture to go along with the premise. I am not sure that I would read this one, but I will say that of all of the times in history I like to read about in my fiction, it would be the 20's! I'm glad to see that there is a silver lining!